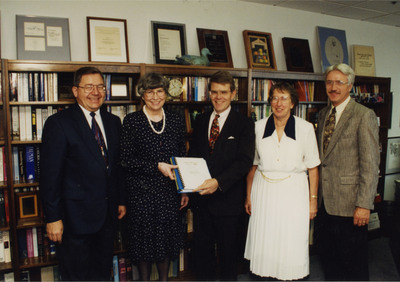 "Rosemarie Myrdal with Dean Monteith"
Group photo of Rosemarie Myrdal and Dean Monteith, State Administrator of School-to-Work Program, with two unidentified men and an unidentified woman. Dean Monteith was hired as the first School-to-Work Administrator of North Dakota in 1994. The School-to-Work Program was established to meet the diverse needs of rural students and to assist with workforce preparation and economic development.